The arrival of a new born baby brings joy to the heart of friends and families and that is what the Yoruba genre of Nollywood is presently experiencing. 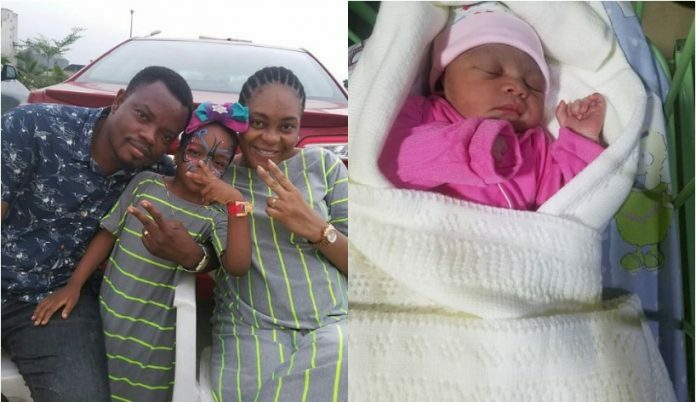 Nollywood actress Sola Kosoko-Abina is currently in a joyful mood as she welcomed a bouncing baby girl with her husband Waheed Abina. According to Bidemi, she alongside some people were organising a baby shower for Sola which was to take place on Saturday, April 21, but as God will have it, the mother of two welcomed her second daughter a week earlier than their plan as the baby will now be christened on the day according to Yoruba culture. Yes my angel is here 🙏🏼🙏🏼 thank you God for this bundle of joy @officialsholakosoko congratulations sis mi 💋💋💋 may God keep and bless the new born 🙏🏼amen 💃💃💃💃 am super happy 😍 funny thing is we were planing a surprise baby shower for her next week sat 🙈 now sat is our angels naming 😂 ise oluwa awa Maridini 🙏🏼God be praise . Meanwhile, We had reported the news of Ubi Franklin expecting his third child from a third baby mama who once worked with him as a staff. Despite going to be a father for the third time, the young businessman said he hope to have two more children before he turned 40.